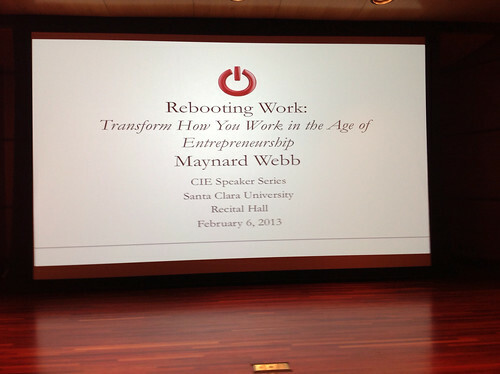 Maynard Webb inspired me with the ideas behind his new book, Rebooting Work: Transform How You Work in the Age of Entrepreneurship, last night at Santa Clara University. He's been involved with the transformation of eBay, the transformation of call centers via LiveOps (where he's Chairman and past CEO), and now the transformation of mentoring though the start-up Outside Counsel. He opened with something I see everyday: Our work outside the organization's walls is more social, more technically sophisticated, and often more productive than the work done inside the walls. As a result, work satisfaction and organizational commitment is down. "What we have outside of work makes the inside of work look stodgy." Technology changed, our expectations changed, and organizations changed (less paternalistic and less focused on employee development for the long term - John Hagel and John Seeley Brown talk about how crazy that is), but not necessarily in an effective mix. 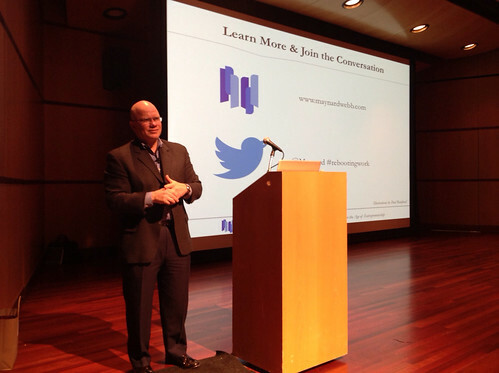 "Leverage the technology revolution that has happened to reboot how we work"
Maynard Webb knows something about transformation as noted above. Also important to know that he's not a work "hippy" (I might be). He started with IBM and speaks fondly of the mentoring he received. If he thinks work is shifting, it is a good idea to pay attention. I'm seeing a convergence on the belief that work will become a service with many more of us as independent agents. Ayelet Brown writes of this as "divorcing your job." Once the concept and boundaries of the job are gone, you are now focused on your life and your work, hopefully in a synergistic way. I have my copy of Rebooting Work: Transform How You Work in the Age of Entrepreneurship and am looking forward to all it has to offer. Thank you to Santa Clara University's School of Engineering and The Center for Innovation and Entrepreneurship for hosting the event.